Works on all devices, including desktops, laptops, tablets, mobile phones, Apple, Linux, and Android. Charlie Christian is one of the most legendary guitarists and the father of jazz guitar. Not only did he help to bring jazz guitar soloing into the modern era, he influenced many of the great players that followed him, including Wes Montgomery, Jim Hall, and Barney Kessel. By working on the material in this eBook, you’ll not only get classic Christian lines under your fingers, you’ll understand the concepts behind his playing, so you can apply those ideas to any musical situation. Essential chord shapes that Christian used to build his soloing lines. Scale shapes that Christian used to create his most memorable phrases. Christian’s arpeggio fingerings that you can use to outline chords. Chromatic notes, phrasing, chord subs, and other Christian soloing concepts. Dozens of soloing lines in the style of Charlie Christian. Full solos that use Christian’s classic lines and phrases over his favorite tunes (Dinah, Rose Room, and Seven Come Eleven). Detailed explanation of Charlie’s favorite soloing concepts laid out in easy to follow and understand language. More than 100 musical examples in both tab and notation to make it easy to learn Christian’s go to soloing concepts and techniques. Over 100 audio examples to accompany the tab and notation. Backing tracks, so you can practice the material in a real life manner. 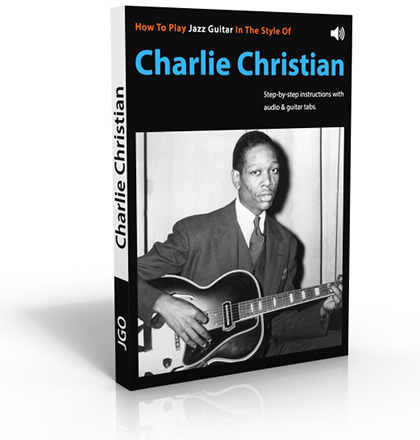 Tips on how to practice and take each Charlie Christian soloing concept further in the practice room. Enough concepts and material to keep any guitarist busy for months, or even years. "What if I'm not happy with the Charlie Christian eBook?" This book breaks down the playing style of the father of jazz guitar. Each concept is easy to understand, and more importantly, easy to directly apply to my playing. I love the way the book includes techniques like scales and chords, but also licks and full solos that get Charlie's sound in my playing. A must have book for any jazz guitarist. It's help, I will practice! Excellent Resource! Someone mention a Djandgo Reinhardt influence. I honestly cannot hear this. Also given that they were born just ten years difference I doubt it. Great book! I think I need it! Yes, Wes Montgomery was inspired by Charlie Christian, but also was inspired by founder of the gypsy jazz Django Reinhardt. Wes took the Django's octaves technique, and involved it into his technique especially! That's why guitar of Wes sounds recognizable!